People have been grappling with the problem of tooth loss for hundreds of years, but only recently has a solution been found that excels in strength and aesthetic quality – dental implants. Whether you are missing one tooth or an entire arch, implants produce such valuable health benefits and lifelike results that you might not even notice them after a while. At Aesthetic Dentistry of South Miami, Dr. Todd B. Barsky can create beautiful restorations for your implants, including high-quality prosthetics. The secret behind the success of dental implants is simple – your natural tooth is made of two vital components. Traditional reconstructive solutions such as dental bridges and dentures only recreate the crown (the white, visible portion) of the tooth. Although these restore the aesthetic quality of your smile, they may lead to the deterioration of your jawbone and your overall oral health. This happens because the root of a tooth (the part under the gum line) normally stimulates your jawbone, keeping it full and healthy through the years. By replicating the entire structure of your tooth, dental implants are able to circumvent these concerns and give you a smile that looks and feels natural. Once we have determined that you are a viable candidate, the dental implant process begins with the surgical placement of a small titanium post into your jawbone. Your implant dentist will recommend a trusted oral surgeon or periodontist for this portion of your treatment. Then, while you heal, your new implant(s) and jawbone will form a strong bond. You will return to our South Miami dental office so that Dr. Barsky can design and place a high-quality restoration that will blend seamlessly with the rest of your smile. Implant retained prosthetics, also known as implant retained dentures, provide a stable solution for those needing to replace all of their teeth on one or both arches. Regular dentures rest on the gums and rely on adhesives to keep them in place. 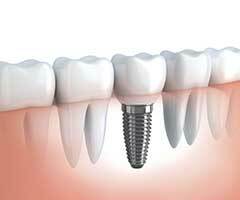 Implant dentures use dental implants inserted into the jaw, to snap on and hold the prosthetic in place. This option will provide the structure and strength your smile needs to support your facial features and will also help prevent jaw bone deterioration. Your new restoration will resemble a traditional denture or bridge, but there is one difference – it attaches to a small number of strategically placed implants within your jaw that make it feel more sturdy and permanent. Your dentist in South Miami will work with you to create the ideal design to restore your oral health. No one should have to contend with a smile that is incomplete. Instead, have both your oral health and your self-confidence renewed at Aesthetic Dentistry of South Miami. Contact us today if you have any questions about our implant services, or if you are ready to schedule your first appointment.